Can Republicans compromise with each other to pass ACA repeal bill? Sen. Mitch McConnell briefs reporters last week on the GOP agenda. It's make-or-break time for Republican efforts to repeal and replace the Affordable Care Act. And right now it's looking more like break. Congressional GOP leaders are scrambling to come up with a compromise between conservatives who want to scale back premium subsidies and Medicaid coverage in the already-lean American Health Care Act, and more moderate members and governors who want to see more generous benefits. The bill is up for a House floor vote Thursday. But the Senate is unlikely to pass the bill in its current form. Republicans in both chambers are threatening to vote no if their demands aren't met, and they can afford few if any defections since no Democrats are expected to support it. But he also acknowledged on Fox News last week that his working-class supporters would do less well under the bill. House conservatives want to scale back the bill's coverage while Senate Republicans want to improve it, which would raise the bill's price tag. A GOP lobbyist said House leaders know the current bill is “dead as a doornail” in the Senate because conservatives likely aren't willing to compromise with Senate moderates. GOP anxieties spiked following last week's release of a Congressional Budget Office report projecting the AHCA would lead to 24 million more uninsured Americans by 2026, with a disproportionately negative impact on lower-income and older people. The bill would drive up individual-market premiums by an estimated 15% to 20% in 2018 and 2019, though rates would drop in later years. 10 years, largely through slashing Medicaid spending by $880 billion, or 25%, and shrinking the number of beneficiaries covered. The bill narrowly passed the House Budget Committee last week, with three conservative Republicans voting against it. The House Rules Committee vote could add amendments that win over conservatives. Those could include allowing faster repeal of extra federal payments to states for expanding Medicaid; giving states Medicaid block grants; and imposing work requirements on beneficiaries. But a group of Senate Republicans told the White House last week they wanted the bill changed to boost premium tax credits for poorer, older Americans, who would face huge out-of-pocket cost increases under the current legislation. They want the tax credits to be based on income and geographic location as well as age, since premiums often are higher in rural areas. Meanwhile, GOP senators and governors are pressing for removing or changing the bill's phaseout of funding for the ACA's Medicaid expansion to low-income adults. They also seek revisions in the bill's caps on total Medicaid payments to the states, which the CBO said could lead to cuts in eligibility, covered services and provider payment rates. And they seek more flexibility in how they run their Medicaid programs. The hospital industry is lobbying hard against the GOP's capped Medicaid funding model. 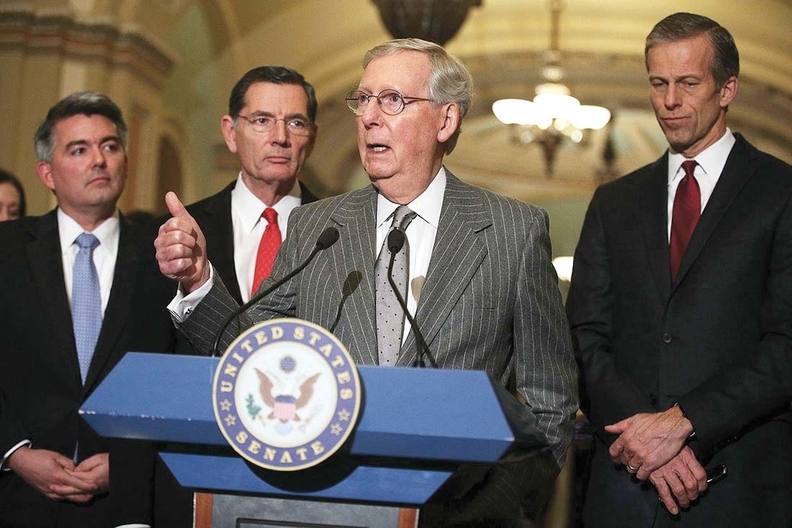 Changes in the tax credit and Medicaid provisions could sharply boost the bill's price tag, reducing or erasing its promised deficit reduction and endangering its ability to meet the Senate's strict budget reconciliation rules. Despite the GOP travails, conservative observers expect Republicans to get their healthcare bill over the finish line.